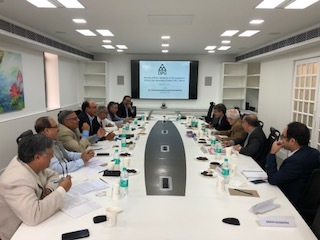 The Delhi Policy Group hosted the Institute for Political and International Studies (IPIS), Tehran, for a policy dialogue on September 7, 2018. 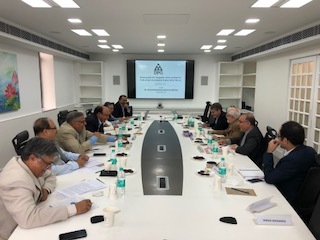 The Iranian Delegation was led by Ambassador Seyed Mohammad Kazem Sajjadpour, President of IPIS, and included Mr. Mehdi Sobhani, Director General, Planning and Strategic Observation Division, Ministry of Foreign Affairs of the Islamic Republic of Iran. The DPG senior faculty was led by Amb. H.K. Singh, Director General. 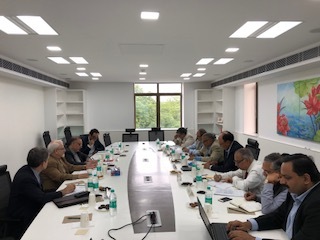 Following presentations by the heads of delegation, there was an in-depth exchange on bilateral, regional and global issues from the perspective of deepening India-Iran understanding and broadbasing bilateral relations for regional development, connectivity and security. DPG and IPIS decided to institutionalize regular exchanges between them, alternately in New Delhi and Tehran.